According to the latest Mobility Index Report published by a research firm called Good Technology, iOS market share in the enterprise market remains high and even goes up. The rival mobile operating system, Android, sees a decrease in market share in corporate sector and Windows Phone platform demonstrates stable results and remains the third most-popular OS. As to the figures, the number of iOS device activations in the third quarter of 2014 grew 2% if to compare with the year-ago quarter. 69% of smartphones currently used in the enterprise market are Apple's iPhones. Phones with Android OS on board accounted for 29%, which is 2% less than in 2013. Windows Phone activations in the corporate sector remain weak, but stable and account for 1%. Good Technology says “The release of the iPhone 6 and iPhone 6 Plus accounted for all of this gain.” More specifically, iOS was down to 66 percent of activations in July and August, but comprised 73 percent of September activations thanks to sales of the new devices. If to speak about the tablet enterprise market, here the guys from Cupertino remain leaders as well. 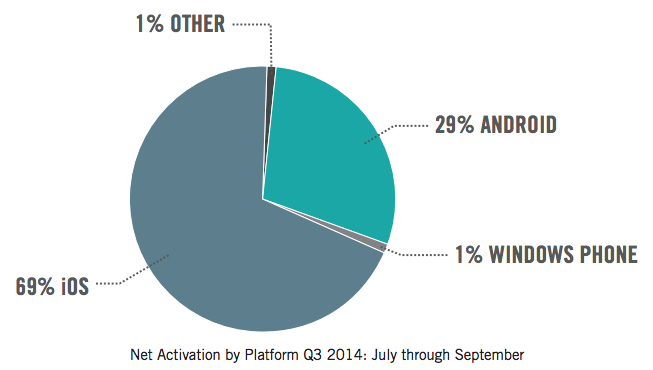 89% of all tablets activated in the last quarter are iPads. However, it should be noted that the share of Android devices grows steadily; this year they accounted for 11% of all tablets utilized in the corporate sector. I'm curious about seeing how the Android market share changes in the next quarter.